Mahindra recently launched the all-new Marazzo in India and while many will be lining up to purchase the car, a fisherman named Jaisal in Kerala is already one of the first owners of the MPV. Mahindra recently launched the all-new Marazzo in India and while many will be lining up to purchase the car, a fisherman named Jaisal in Kerala is already one of the first owners of the MPV. 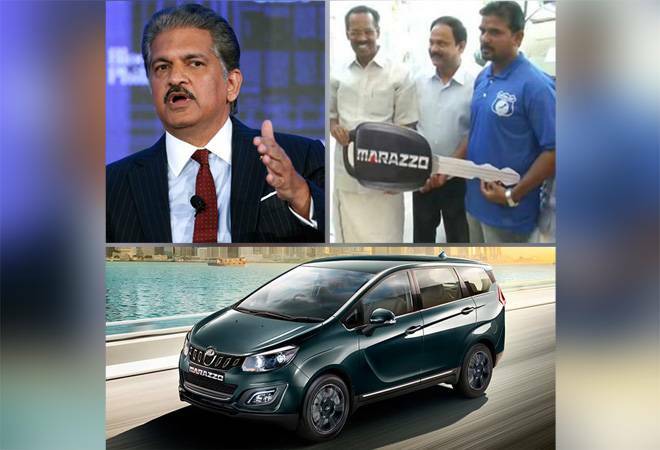 According to a report by Car and Bike, Anand Mahindra decided to gift an all-new Mahindra Marazzo to Jaisal who helped many people during the Kerala floods. The man was recorded on video, helping people climb a rescue boat by getting on his fours while being mostly submerged in water. Anand Mahindra has in the past given away a TUV 300 to weight lifter Mirabai Chanu and offered an auto rickshaw driver a Mahindra Supro Mini. He has now gifted the Marazzo to the fisherman for showing extraordinary valour in times of crisis. The Marazzo was launched in the first week of this month. The car is placed in the competitive MPV segment against Maruti Suzuki Ertiga and Honda BR-V. Mahindra claims the Marazzo has been designed with a shark in mind. The car sits below XUV500 but is placed above the TUV 300. The Marazzo is available in two seat configurations, seven-seater and eight-seater. The seven seater variants come with two captain seats in the middle row. The ex-showroom prices range from Rs 9.99 lakh to Rs 13.9 lakh. The Marazzo is built on an all-new platform. It is also powered by a new 1.5-litre diesel engine that develops 123 PS power at 3500 rpm and 300 NM of torque at 1600 rpm. The engine is mated to a six-speed manual transmission. The Mahindra Design Centre designed the car in collaboration with Italy's design house Pininfarina. According to Mahindra, they spent $200 million to develop the product. Mahindra will be launching a compact SUV, codenamed S201 later this year which is expected to fall in the sub-Rs 10 lakh bracket. However, this car will be longer than 4 meters, so it will go against the likes of Hyundai Creta and Renault Duster. Mahindra will also launch a premium SUV that will go against giants like Toyota Fortuner and Ford Endeavour.